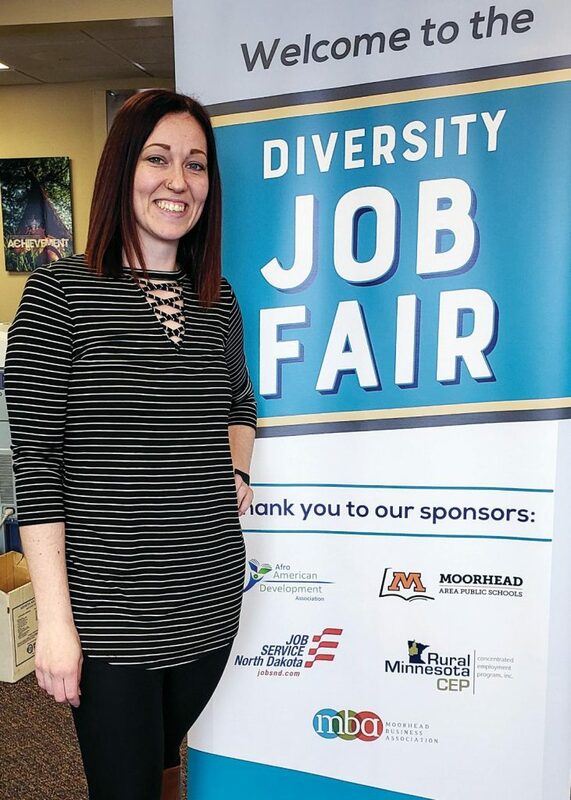 When the Moorhead Business Association, Rural Minnesota CEP and other agencies launched Moorhead’s semiannual job fair three years ago, they named it for one group of people looking for work – the New American Job Fair. “We’d noticed a disconnect – lots of people looking for jobs, and companies looking for workers. The job fair was started to bring them together,” says Hillary Theurer, the social worker who’s putting together this year’s spring event. She is on staff with key sponsor CEP (“concentrated employment program”), working out of the Minnesota Workforce Center in the Clay County Family Service Center. “But then we realized we could open it up and make it far more inclusive,” she explains. Thus the name change to a broader focus. The Diversity Job Fair, then, is for anyone and everyone looking for work. Next Tuesday, March 26, will bring more than two dozen local employers together with job seekers of every background and nationality. They have just one thing in common: They’re looking for jobs, and they are eager to connect with the bosses who need willing workers. As of early this week, 27 companies and agencies had already registered to take part in the event, scheduled from 10 a.m. to noon in the atrium at the east end of the Center Mall. They range from Sanford and Essentia hospitals to home care agencies, from American Crystal Sugar and Integrity Windows to Doosan Bobcat and Jennie O, and from the Moorhead school system and police department to temporary help agencies, several banks, the postal service, the U.S. Census Bureau … and more. The roster may be even longer by next Tuesday. Hillary notes that businesses can register until the day of the event or until the capacity of 40 is reached. About 120 job-seekers have attended the semiannual get-togethers in the past. She’s hoping even more will be there Tuesday morning. Employers aren’t the only ones who’ll be there to help them. Interpreters of Kurdish, Arabic, Swahili and Somali will be on hand to help those with limited English fill out applications. Other resources will also be there to help sort out potential obstacles such as child care; along with transportation, it’s the biggest roadblock between many willing workers and the employers who need them. Hillary, a native of Mandan, N.D., joined the program a year ago after completing her degree in social work at Minnesota State University Moorhead. Her caseload includes helping about 40 people, including a number of new Americans, achieve independence through education and employment. In addition to MNCEP and the business association, the job fair’s sponsors include Job Service North Dakota, Moorhead Area Public Schools, the Afro American Development Association and JobsHQ. The MBA handles registration, including collection of the $50 fee charged employers. (Participation is free for job-seekers.) Employers can get more information and register for Tuesday’s event at www.mhdmba.org/event-3286812.